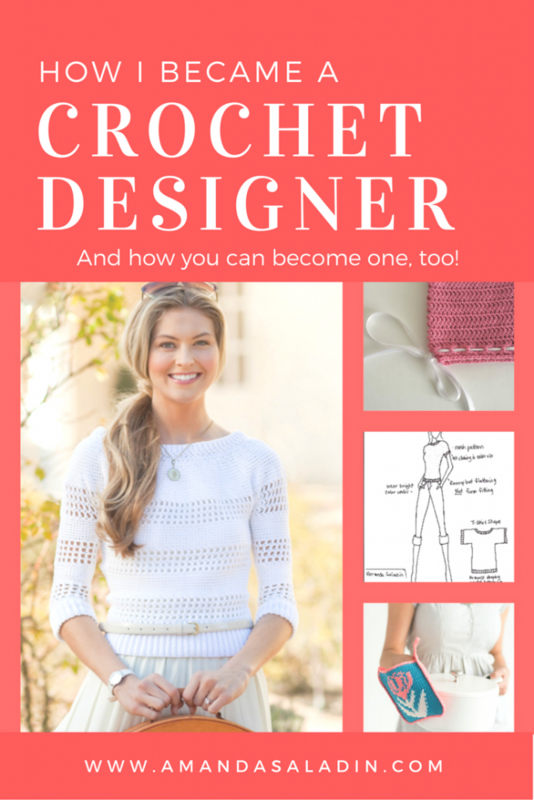 How to Become A Crochet Designer - love. life. yarn. 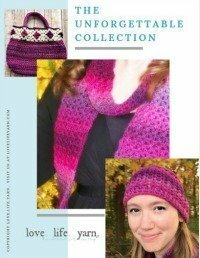 I am asked all the time how I became a crochet designer and what it takes to design crochet patterns. Today I’m going to walk you through exactly how I became a crochet designer and show you some steps you can take if you want to become one, too! When I first started crocheting I never imagined that I would make the jump to a designer. I was a knitter first and had a huge collection of knitting magazines and did not attempt to make anything other than a printed pattern. Crochet was the same way, only I didn’t amass such a large magazine collection! People I knew really liked my crocheted items and it gave me the confidence I needed to put a few items I had made in our State Fair. Everything I entered won either first or second prize! I was so excited! This made me want to do more with yarn than just follow a pattern someone else had made. So I set out to learn all that I could about how my designs could be published in magazines. At first, the task seemed so daunting. I thought you had to create the entire item and then try to pitch it to publications. I wasn’t sure if that was something I could do. I mean, all that work and you didn’t even know if it was going to be accepted?? After researching for a while, I found that you don’t have to do the work up front in most cases. In fact, you just have to sketch out what the design would look like and create a swatch showing the stitches you would like to use. I knew I could do that! So I got to work sketching like mad and creating a ton of 6″ x 6″ swatches. The first place I submitted to I had to physically mail my submissions in. I didn’t scan them or take pictures (hint – if you have to put them in the mail, please scan them or take a picture before!). One of them was lost and I’ve never recreated that particular design. I did end up working with this magazine, but not until I had been published elsewhere. Then I found out that most places just require you to email them a sketch and a swatch. This was the way to go for me! After researching, I found some magazines that had their submission information online. I didn’t have an editorial calendar – and wasn’t sure exactly what types of submissions they were looking for, I just sent in some ideas and hoped for the best. I have been thinking about writing this post for a long time and finally sat down to do it. My first acceptance for a design was accepted on November 28, 2011. It was for a sweater!! Someone was actually willing to pay me $500 to make them a sweater and write out the pattern! I was ecstatic! Never mind that I had never written a pattern before in my life – I was going to be a published designer! (I don’t recommend starting out writing a pattern for a sweater, but that’s how I ended up doing it.) This sweater ended up in Crochet Today! magazine in the May/June 2012 issue and it even made the cover. I received my second acceptance from Crochet World before I had even finished this sweater. It was for a little boy’s sweater (my oldest son is finally old enough to wear this design now). Not all publications will send you back your finished items but there are some of them out there that do. 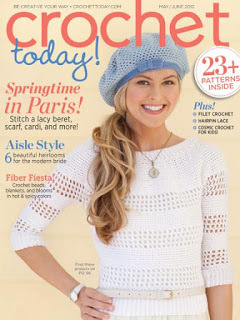 I Like Crochet and I Like Knitting are two digital magazines that I now work with the most. I love working with the editors there and you get the rights back to your work 6 months after publication, which means you can sell it yourself and make even more money with it! 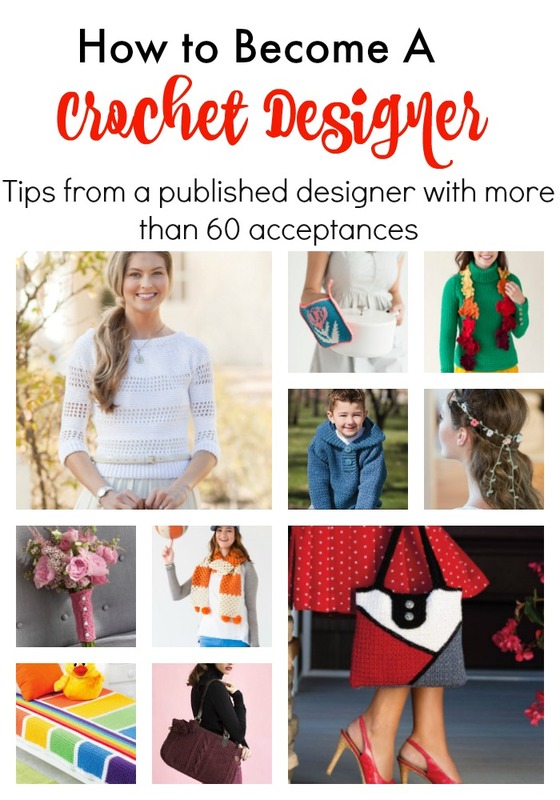 To date I have published over 60 patterns with almost all major knit and crochet magazines and even several that you can find on the Red Heart website. That doesn’t include the self-published patterns you see here on the blog. I’ve designed almost nonstop since I started and I can’t believe it. My husband said in the beginning he was afraid I would overdo it and have too much work and I laughed at him. But he was right! A dream come true! I get paid to do something I love in my spare time. Is this something you would like to do, too? So you think this is something you would like to try? Go for it! What’s the worst that can happen? No one accepts your design submissions. I told myself I would submit a certain number of designs (I can’t remember the exact number) and if none of them were accepted I would quit. It only took about 10 before I had an accepted submission. You will never know unless you try! Your submissions don’t have to be perfect, so give it a go with what you have. I list this as step one instead of creating the designs because publishers are looking for specific things for each issue. Why waste your time designing a baby blanket only to find that they are looking for lacy scarves? Several designer groups on Ravelry post calls for submissions and this is a great place to start. Also, check out your favorite magazines. For example, if you go to the Interweave Crochet website and scroll down, you can find their “submissions” link near the bottom. From there they link to all the crafts and issues they are seeking submissions for. There are also instructions for how to submit to them. Some places will ask you to send them an email to get the editorial calendar. Look around – you can find a LOT of places to submit your work! Don’t forget yarn companies! So you have an editorial calendar or mood board and now you’re ready to begin submitting. First, look for inspiration. I have a ton of secret Pinterest boards that I have labeled “Inspiration” then the category (Example: “Inspiration – Hats”). Before that, I kept a folder on my desktop labeled “Knitting” (I know, I know, I should have named it “crochet” since that’s what I do the most but it works ;). Inside my “knitting” folder is another folder for “clothing ideas”. Inside this it is broken down even further into accessories, home decor, babies and kids… you get the idea. These are not ideas that I plan on copying and a lot of them aren’t even made of yarn – they are just things that inspire me. If a magazine is looking for a certain item I will use a google search for inspiration. For example, I needed some Easter ideas so I looked up “Easter knits” and “Easter crochet” for inspiration. To broaden my search I looked up “Easter decor”, “Easter gifts” and such. Then I had a ton of ideas for Easter projects and planned what I would actually like to make. Keep in mind that you should be certain you can create the finished project before submitting it. Don’t submit for a complicated sweater if you’ve never made a sweater before! My first accepted design was a sweater, but I had made several from other patterns before I attempted that and knew how they were constructed. A good place to start would be a scarf, cowl, or maybe even a blanket. If you need help check out these posts I’ve written on how to design your own: scarf, cowl, and blanket. As far as sketching goes, it doesn’t have to be fancy. You can trace fashion figures or flats of scarves or blankets. The editors are used to using their imaginations to put swatches and sketches together to get an overall feel for what the project would be like. A simple, clear picture is really all you need. Now you need to have a good stitch dictionary. I was afraid to use these at first until I went to a Crochet Guild of America (CGOA) conference and found out you can’t copyright a stitch pattern – so go out there and get yourself some good stitch dictionaries and get inspired! Start swatching. The swatch should be large enough to show off the stitch pattern, no less than the typical 4″ x 4″ square. I usually make mine about 6″ square. Use the hook size you would probably use for the design itself and do your best work. Weave in the ends and scan the swatch or take a picture. A scan or photo of your swatch and sketch will make them ready for email! So now you have a great swatch and sketch you’re excited about and are ready to submit. Each publication should give you clear instructions for submissions. Most will ask you to email: the swatch, sketch, and a description of the items. They will also give you the email address to send to. A few publications want submissions mailed in (just be sure to keep a record!). Keep the deadline for submissions in mind – don’t send in any late, as they will not be considered. Now comes the hardest part… waiting. It often takes a few weeks to hear back, even when you’ve been accepted. You have to be patient. I know how hard it can be, especially when you are new, but please to not email the editor asking if they have accepted your submission. One of the great things about I Like Crochet magazine is that they answer every email so at least they let you know one way or the other. If you get a “no” don’t take it personally, you can submit that idea somewhere else. I have recieved a bunch of “no’s” and those were still good projects that ended up getting published elsewhere. A “no” doesn’t mean your idea isn’t good, it just means it isn’t right for that particular issue. I wouldn’t resubmit a rejected design to the same publication but that doesn’t mean someone else won’t want it! Step Four: Your first acceptance! Being notified of your first acceptance will be so exciting!! You will want to get started right away but you will have to wait for yarn to arrive. Some companies will have you find your yarn but many will have the yarn they want you to use sent to you. Sometimes you keep the extra yarn, sometimes you have to send it back. There are so many variables when it comes to the different publications! Just read their guidelines and contract very carefully and you’ll do fine. So that’s about it – you start working once the yarn arrives and finish up your design before the deadline. Make sure you write down every last detail of how you create the design to write the pattern as you go. Most of the time I write the pattern on paper and go back at the end and type it, but now I have been trying to type it as I go. That way when I get to the end of the project I’m not like “argh… now I have to write the pattern!” because it’s already done! Especially once you start designing more complicated things like sweaters. Whew, so I know that is a LOT of information to take in. I know it can be really overwhelming, but how I wish I had known all of this when I started designing!! I’m working on an ecourse that shows exactly what I do from submission to finished item. If you want a FREE submission worksheet and information about this course please submit your info below. In the course I will share all of my secrets and tips that have brought me a few thousand dollars yearly in extra income. All this from doing something I love while working full-time and juggling four young kids! Thank you so much for sharing! Im just dipping my toes in the water so to speak on designing my own stuff, I really love to make dresses for little girls and babies but havent figured that out yet to do my own but Im getting there. WOW!! I had no idea this is what you have to do to get your creations published. Thanks so much for the information. I’m going to try to start my own patterns being published from your help. My favorite thing is crocheting shawls and wraps. I have made one for every female in my family who would wear one. But mostly for my Mother. Again, thank you so much for the information to begin . I have never seen any other published knitter or crocheter trying to help newbies get started!! This is very interesting. I have picked up my needles the last 3 years crocheting shawls, wraps, tops, and dresses using every type of yarn you can think of – but gave them away as gifts. I am now starting to charge and realised that as I research designs for inspirations that I have created one off pieces. I am interested in becoming a published designer and found this very helpful. Thanks for this wonderful inspiration. I do a lot of knitting and crocheting but I always give them out as gifts since in Nigeria here, not many people do appreciate things like that because of our weather. It is now that I realise that I can design and be a publisher. .your information is very helpful. Your blog shall be visited often from now on. Tks. Yes, Jumoke, what a great idea!! Most publications accept international submissions so this sounds like a wonderful option for you. 🙂 Glad I could be helpful. Amanda, I love to crochet , I am now in my 45th year of making everything from afghans, sweaters, hats, and more. I follow pattern directions, but if I don’t care for part of the pattern I create my own pattern or stitch. It would be fun to create something of my own, never thought of doing this. That’s amazing that you have crocheted so long! I hope I can say that one day 🙂 I learned when I was 26 so it’s been 12 years for me. If you can create part of a pattern I’m sure you can create something from scratch! I used to collect knitting and crochet mags and now I never use a pattern because it’s so much more fun to make up my own. Let me know if you ever need anything!